Yesterday, we launched a new competition called STYLE WAR, where we're asking you to vote to decide who the best-dressed rapper of all-time is. Right now (in Round 1), there are a whopping 64 rappers competing for the belt (click here to register and begin voting if you haven&apos;t already). Despite being the most famous (and arguably the best) rapper in the entire world, Slim Shady never developed a superstar fashion sense to match. 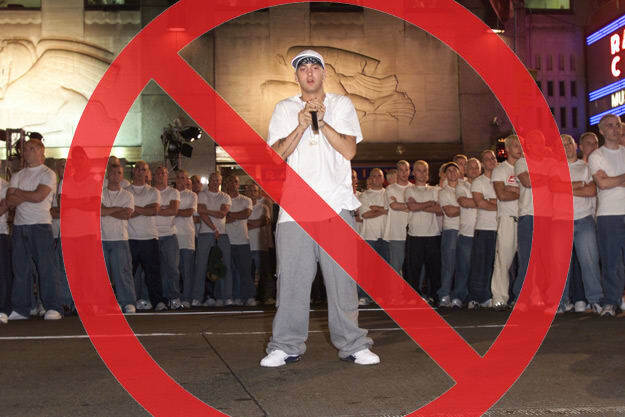 Even with all that money, Em was never really able to move past his overwhelmingly generic Jordan sweatsuit and white Tee look. Also, one thing in racial relations that definitely hasn't changed since Obama's election: white boys still look corny in du-rags. Sorry. It's not that Luda is a bad dresser per se (okay, sometimes he is), it's just that he's always been more of a fashion follower than a trendsetter. Despite being one of the most consistent hitmakers in hip-hop and one of the most lyrical mouths of the south, Luda has never found a look that really works for him. Maybe he should stick to the Hollywood-friendly formal wear he's been rocking lately, because his ability to keep up with hip-hop fashion trends has always been questionable. The Tung Twista might rap fast, but he's a little slow when it comes to dressing well. Too often, his outfits cross the line from outrageous to just ugly. Also, if you're standing next to Don Magic Juan and you&apos;re the crazy looking one...that really says something. The good Doctor might be the greatest producer of all time, but he's one of hip-hop's most boring dressers. Sure, he looked pretty cool back in his NWA days, but he was basically just sticking to the uniform established by Eazy-E. Since then, Dre manages to look a little uncomfortable no matter what he has on, kind of like an alien wearing clothes for the first time. It's not that Soulja Boy has wack style (although we're sure some of you might disagree with that statement). What's the real reason he wasn't included in STYLE WAR? He's too young, people! You'll notice that almost everyone featured in the contest put out albums before 2007. To recognize the new generation of MCs—including Soulja Boy, Kid Cudi, Plies, Wale and more—we'll be holding a special vote next week to decide the Best Dressed New Rapper. Stay tuned! CLICK HERE TO SEE THE OFFICIAL STYLE WAR BRACKET!